The nuts and bolts are tiny, and the spaces are a little tight. I find it really helps to use a set of tweezers and a small Phillips head screwdriver. It’s easiest to start with the Explorer board and put on 2 nuts and gold screws (nuts on the side with most of the wiring) inside the little outline where the Edison will eventually sit. Gold screws should be placed as shown, with nuts on the backside. Then, lay the Edison board on top, aligning the screw holes. Use a small Phillips head screwdriver to tighten the screws into the gold screws beneath them. The Edison board should not wobble, and should feel secure when you are done. Attach your battery into the explorer board plug. A single red light should appear and stay lit. During the course of your OpenAPS rig use, it’s good practice to periodically check that the nuts and screws stay tightened. If they come loose, the Edison can wobble off the connection to the Explorer board and you will either get looping failures (if it’s loose) or be unable to connect to the Edison (if it comes completely off). 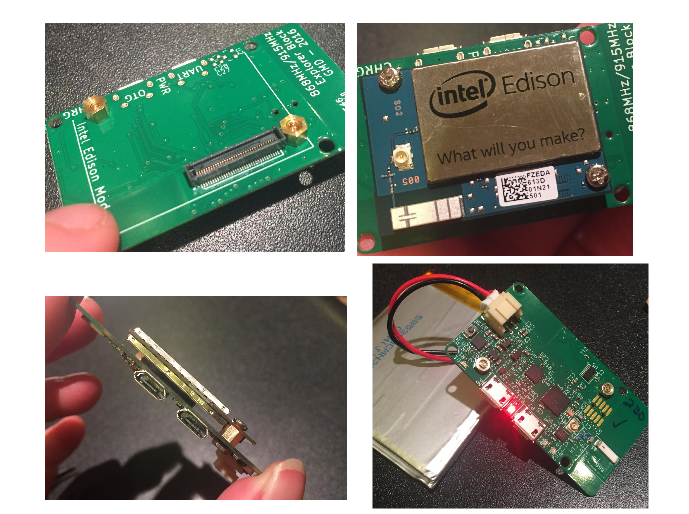 The Edison comes with an operating system that doesn’t work easily with OpenAPS. The first step is to replace the operating system with a new one. This is called “flashing” the Edison. Let’s start by downloading the updated operating system (it’s called Jubilinux) to your computer so that we can install it later onto the Edison. 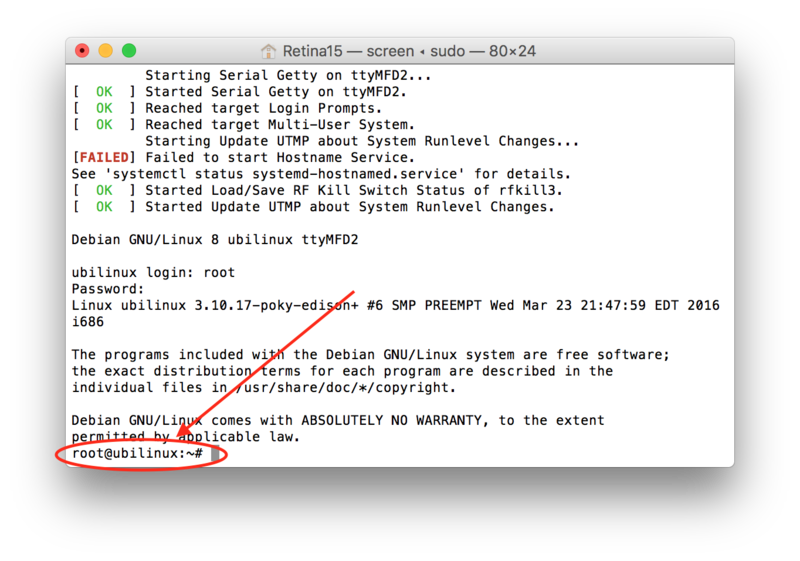 Go to Safari and download Jubilinux (jubilinux 0.3.0 is the only fully supported version; jubilinux 0.2.0 runs Debian jessie, which is NOT supported by Debian any longer). Note: Before starting to flash an Edison using a Mac, if you are using a Macbook with a USB-C Hub you may encounter some issues with the flashing process, including the wireless LAN setup not functioning correctly, so if you have an option to use a PC or Laptop with directly connected USB cables, it may be better to do so. The OpenAPS uses Terminal, kind of like Loop uses Xcode. It’s our interaction with the code that forms the basis of the loop. You may have never even used the Terminal app. 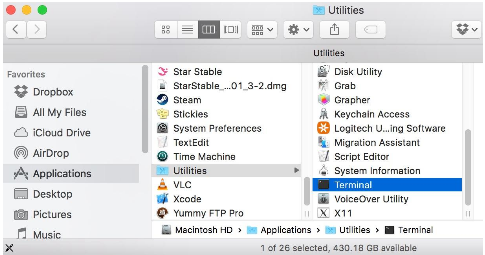 Go to your Applications folder and find the Terminal App in the Utilities folder. Double click to open it. 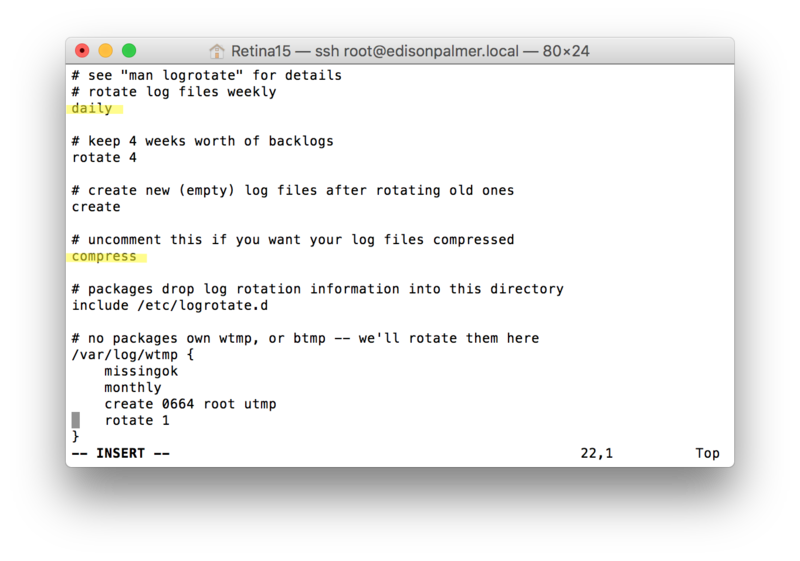 Terminal app is an ugly, plain interface…but it does what we need to do, communicate with the Edison. Basically, the Edison is a computer that lacks a keyboard and display. 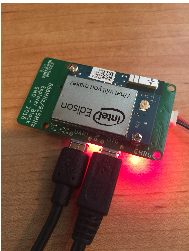 By using a cable connected to the rig, we can login to the Edison and use Terminal as a way of interacting with the Edison. When you first launch Terminal, you will probably see something rather plain like below. The important thing to know is that the Terminal helps show you WHERE you are in your computer or Edison. So, in the screenshot below, it’s telling me I am in my “iMac4K” user account. If you are ever a little confused where you are…you can look to the left of the $ prompt and get an idea. If you’re like me, you don’t “speak linux” (or python or java or…) nor do you really know what linux is. 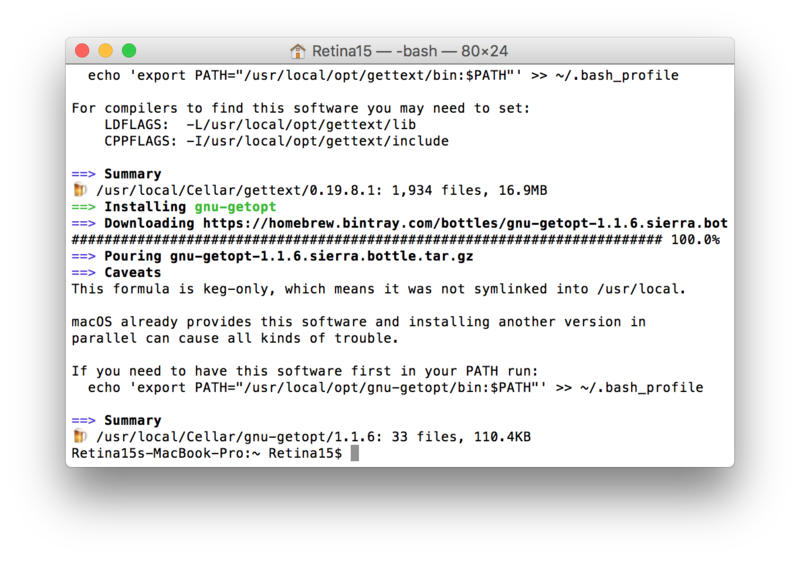 So, you’ll be comforted to know that most of this setup is copy and paste commands into Terminal. You won’t need to suddenly learn linux…just will need to follow directions and be willing learn some basics. IMPORTANT NOTE: STEPS 1-10 will be updated periodically, and also will likely be out of date. Since this is just a cheat sheet for Mac users, it may not have all the troubleshooting tips or updated info that the main OpenAPS docs have. If you get stuck and this guide’s set of instructions do not work at the moment, the place to look is the OpenAPS Walkthrough Phase 0, Setting up your Intel Edison for the full information on this part of the OpenAPS setup. You will be prompted to enter “RETURN” to continue and then enter your passcode for the user account (your computer password). 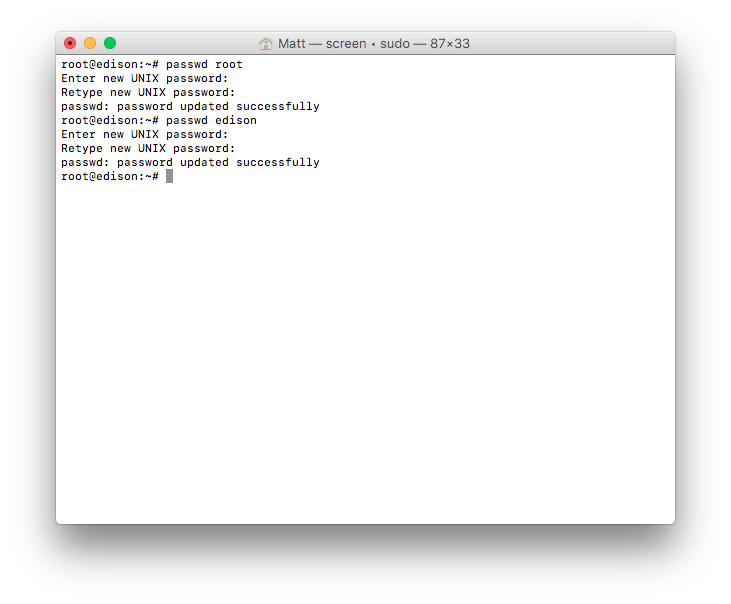 When you type the password, you will not see any letters appear in the Terminal screen..that is normal. Terminal does not show keystrokes for passwords. It will take about 1-2 minutes for Homebrew to install. You’ll see a bunch of commands scrolling by in Terminal window. 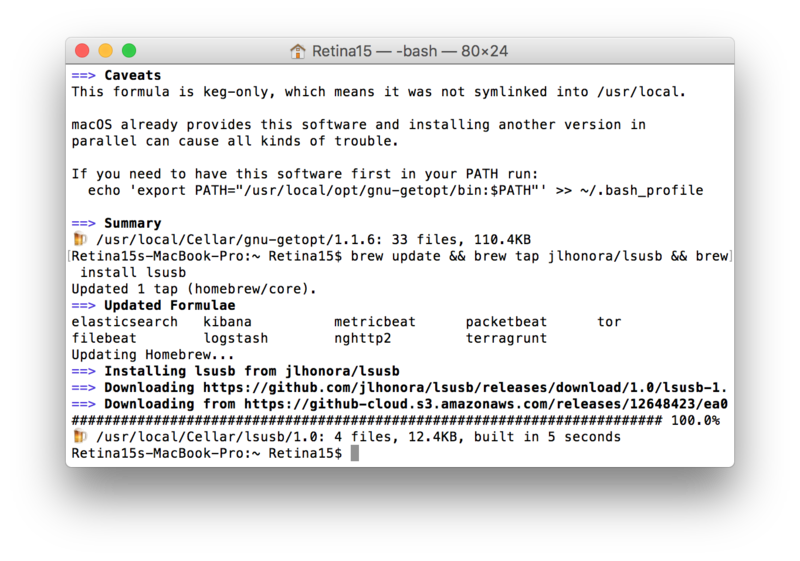 Just wait it out until you see the screen showing Installation successful and you’ll be returned to the $ Terminal prompt. You’ll most likely be asked for your computer password again. Enter it. A blank screen will likely come up, then press enter to wake things up to show an Edison login prompt. Login with username “root” (no quotes) and no password will be needed. Leave this window alone for a bit as we proceed with next steps. 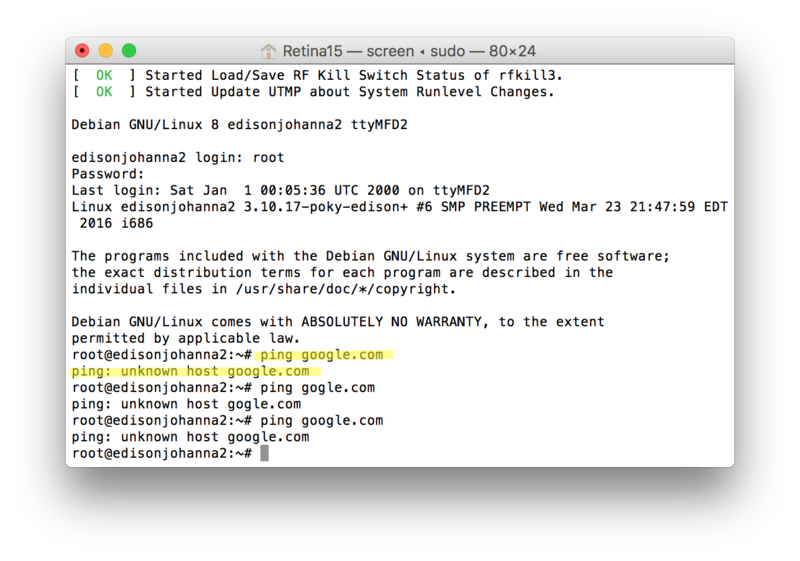 If you have a problem getting to the Edison login prompt, and possibly get a warning like “can’t find a PTY”, close that terminal window. Then unplug the usb cables from your computer (not from the Edison...leave those ones as is) and swap the USB ports they were plugged in. 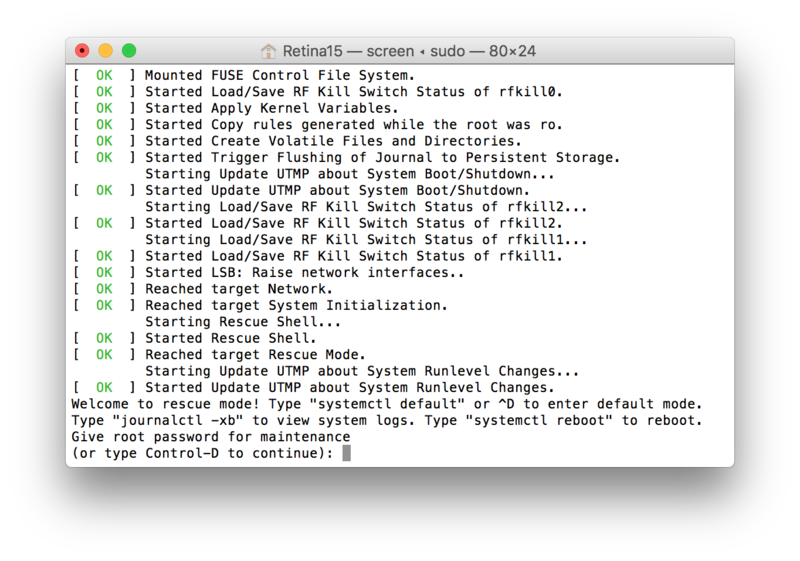 Open a new terminal window, use the sudo screen /dev/tty.usbserial-* 115200 command again. Usually just changing the USB ports for the cables will fix that “can’t find a PTY” error. 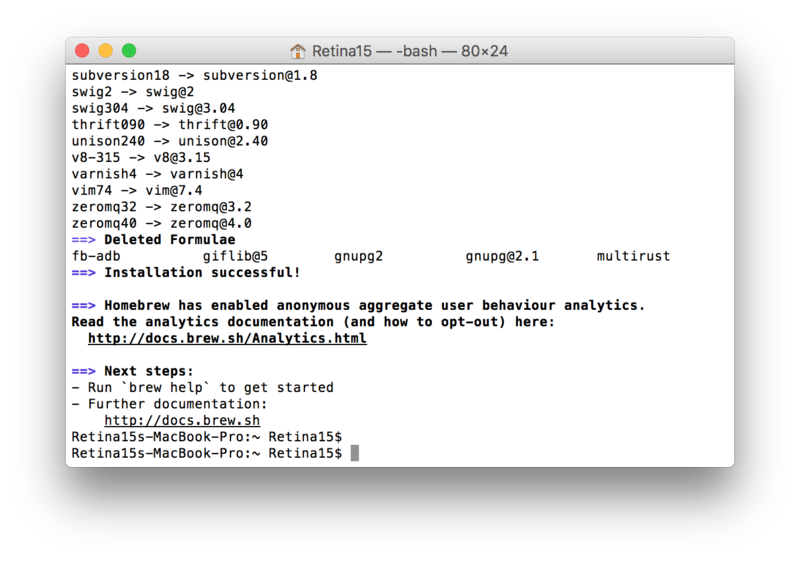 Open a new Terminal Window (leave the existing one from that last screenshot open…we need a second window) by selecting command-N or using menu bar Shell>New Window>New Window with Settings-Basic. In the new window, enter cd ~/Downloads/jubilinux This will change your directory. 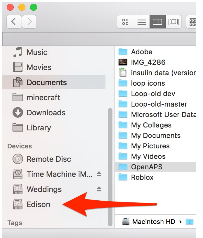 You may see a message notification that the Edison “Disk Not Ejected Properly”. Don’t worry...it is rebooting. You will see some processes going on in the background. in the terminal window where you ran ./flashall.sh. As it says, this should take about 10 minutes. It may appear like nothing is happening for awhile, but wait it out. If it didn’t take long at all...chances are that the flash didn’t really work, in which case you should read through the [full docs] and try again, and/or check out the Troubleshooting section at the bottom. 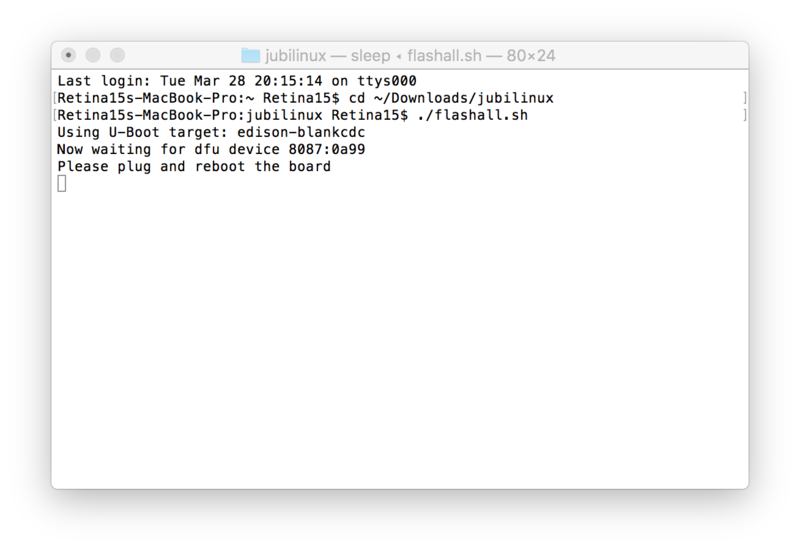 OLDER JUBILINUX VERSIONS: After flashing is complete, watch the window as you should get asked to type control-D to continue. If so, go ahead and press (don’t type that out, just press the keys) control-D to keep going. NEWER JUBLINUX VERSIONS (0.1.0 and later): You probably won’t get asked to Control-D and that is fine. That is also fine, and you can ignore it too. Use login root and password edison to login to your newly flashed Edison. 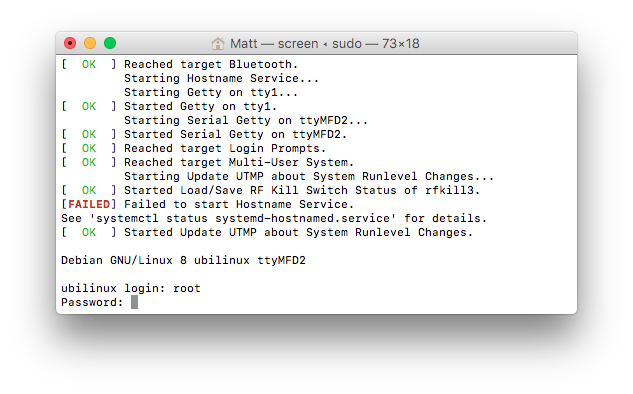 After logging in, you will notice that the Terminal prompt says root@ubilinux:~#. This is the correct prompt for the jubilinux system. You will not see jubilinux in the prompt. 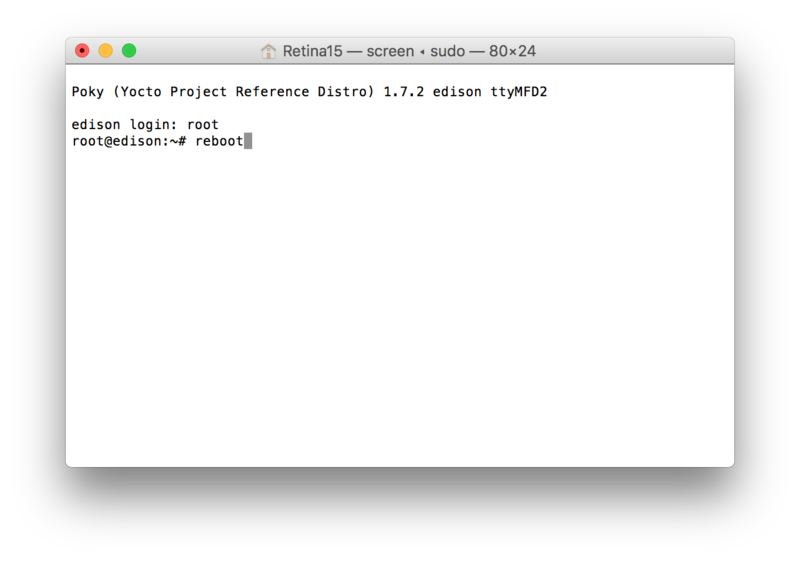 If you bought a pre-flashed Edison, this is how your initial Terminal prompt will look. CONGRATULATIONS! You just flashed the edison! Wahoo! 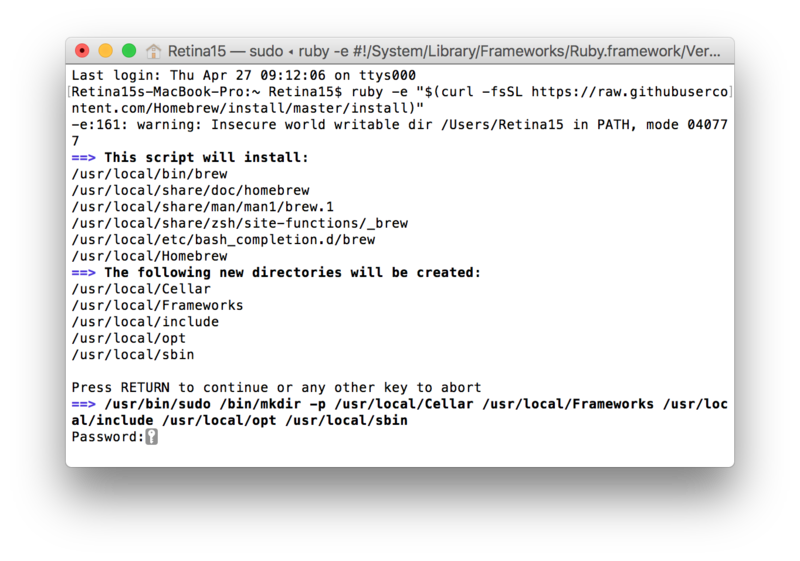 Now, head back to the install instructions for the easy bootstrap script process of setting up wifi. (Below has the manual instructions, but most people prefer the quick bootstrap script option). 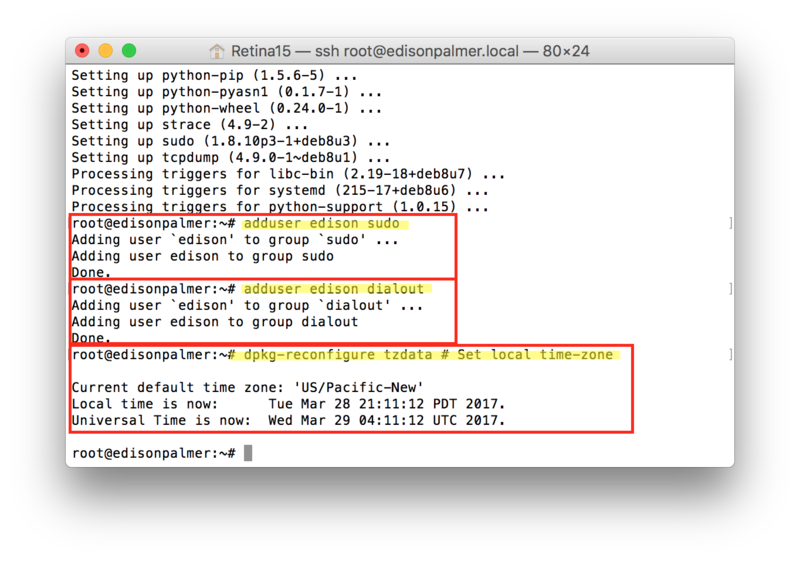 From that same screen we just left off , enter these commands to rename your Edison’s hostname. myedisonhostname=<thehostname-you-want> <—But replace the <> section with your chosen hostname. I used “edisonhost” as the name, as shown in screenshot below. A-2. A screen similar to the one below will appear. Type “i” to enter INSERT mode for editing on the file. If you are new to INSERT MODE, realize that INSERT MODE inserts characters at the highlighted cursor (it does not overwrite the character showing beneath the cursor). And, the default is that the cursor will be at the top left of the screen to start, so you will need to use the arrow keys to move the cursor to the area where you want to start typing. If you freak out that you’ve made a change that you don’t want to commit...you can simply press the ESC key and then type (no quotes) “:q!” to quit without saving any of your typing/changes. 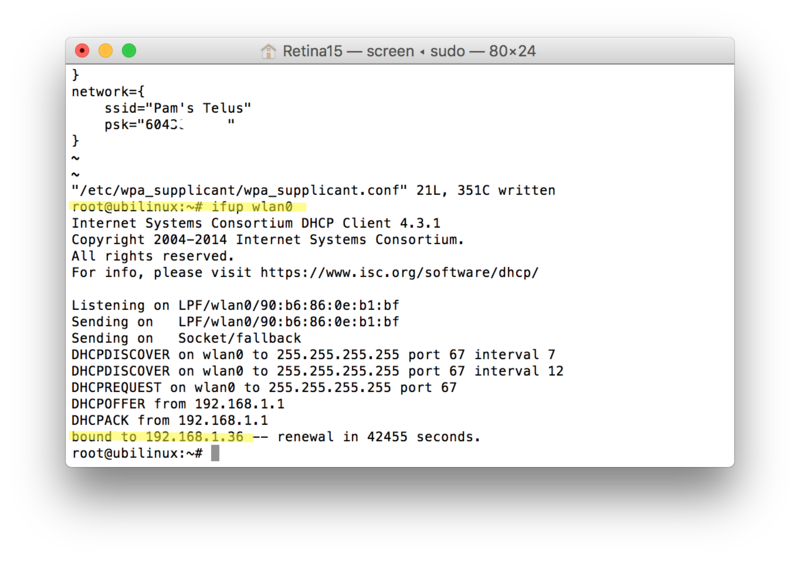 add wpa-conf /etc/wpa_supplicant/wpa_supplicant.conf right below the iface wlan0 line. A-4. Press ESC then type “:wq” (no quotes) and enter to write (save) and quit that screen. When you press ESC, you won’t initially see much different, but when you type ”:wq”, you will see the characters appear in the lower left of the screen. B-2. Type “i” to enter INSERT mode for editing on the file. B-3. Add the following for each wifi network you’d like to add. The networks you enter here are the wifi networks that your rig will be able to use to stay connected to internet. Examples shown below. One is my home wifi, the other is my iphone’s personal hotspot. 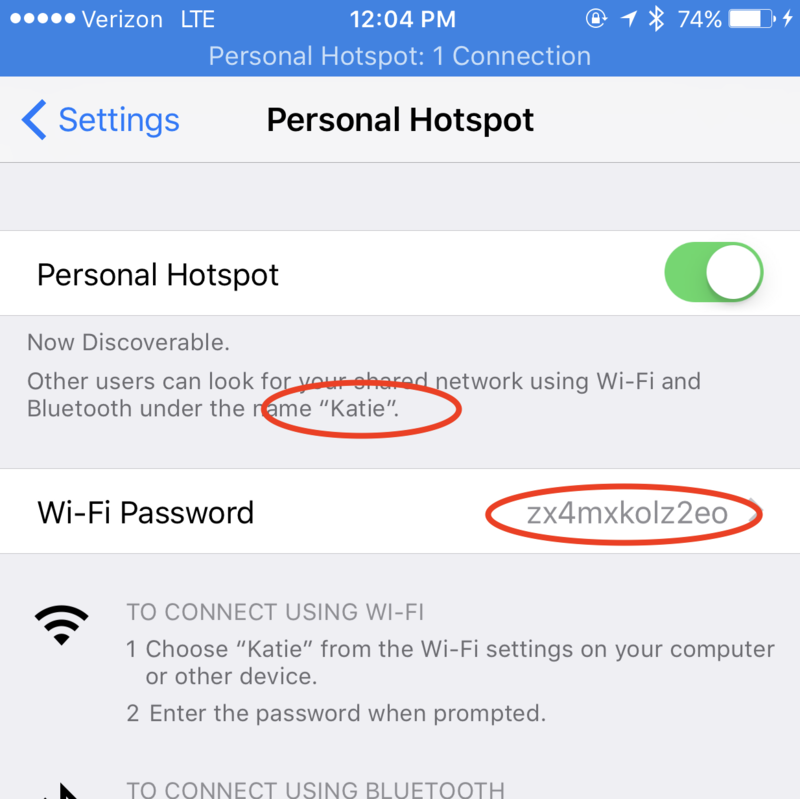 Note: If you don’t know your personal hotspot’s information, you can find it under your iPhone’s Settings, Personal Hotspot as shown in the screenshot. You should add your personal hotspot to the list of wifi networks as a backup if your BT-tethering to hotspot does not work. 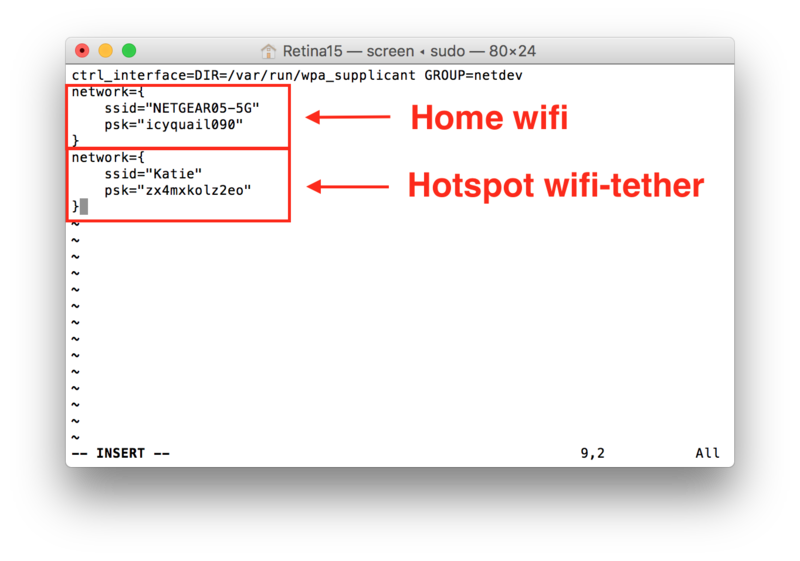 By toggling your hotspot off-on, it will generate a wifi-tether signal for approximately 90 seconds, so that your rig can find it and connect. Since wifi-tethers are similar to a regular wifi connection, your rig will not automatically hop off this connection when it gets to your home wifi network. You will need to remember to turn off your wifi-tether if you want your rig to connect back to your home wifi network. By contrast, a hotspot connection done by BT-tether does not require any toggling and your rig will connect/disconnect as it leaves/comes to a known wifi network in your wp_supplicant list. If you haven’t done it, a good idea is to update the name of your iPhone to remove any apostrophes. Apple’s default is to name iPhones with an apostrophe such as “Katie’s iPhone”. This can cause some problems for wifi connections sometimes. You can rename your iPhone by going into your iPhone’s Settings, General, About, and then Name. Some wifi networks require you to accept a terms and conditions prior to allowing access. For example, Starbucks coffee shops and many hotels. These networks are termed “captive” networks and connecting your rig to captive networks is currently not an option. B-4. Press ESC then type “:wq” to write (save) and quit that screen when you have finished adding the wifi networks. You can always come back and add more networks as needed, using the same process. If you don’t see a message showing you are successfully connected, go back to the start of Step 1-9 and make sure that you don’t have any typos in those two files. ALRIGHTY...Your Edison is coming along. Now we are going to set aside the Edison “screen” terminal window (in case we can’t get in via ssh), reboot, and login using an “ssh” command from a new Terminal window. 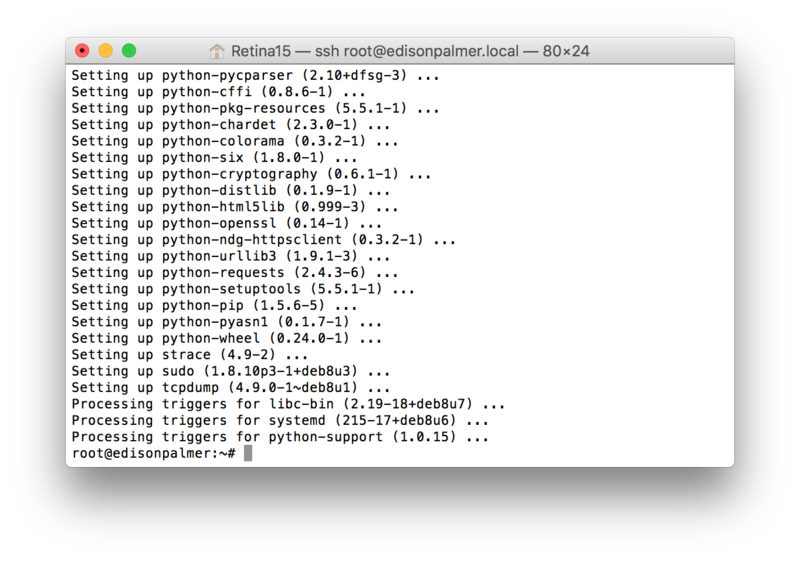 Wait as many lines of action go by in the Terminal window...eventually you will get to a prompt that has your new edisonhost name login. We aren’t going to login right now. Just saving that window in case we need it later. 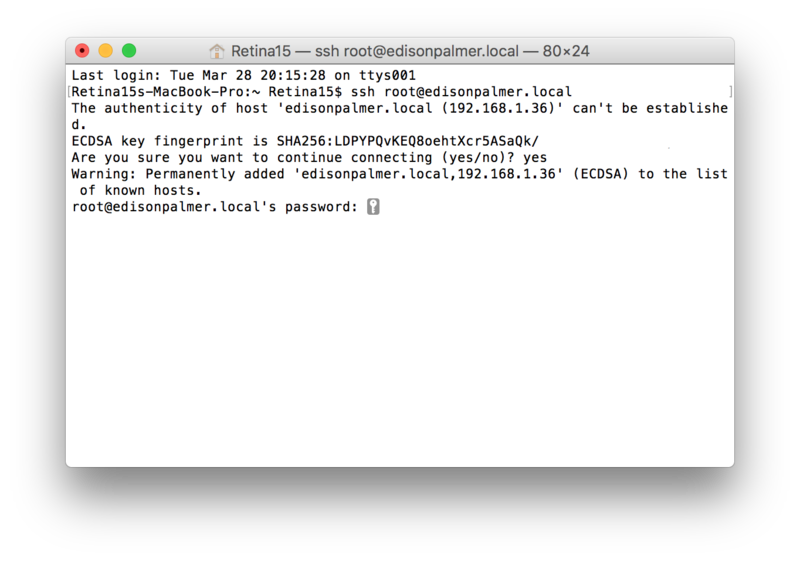 Login to your Edison by entering ssh root@edisonhost.local (changing edisonhost to the hostname you selected earlier above). If you see warnings about the authenticity of host can’t be established, you can say yes to continue and add the new edison to your known hosts list. This message typically appears when you’ve set-up multiple edisons on the same computer. 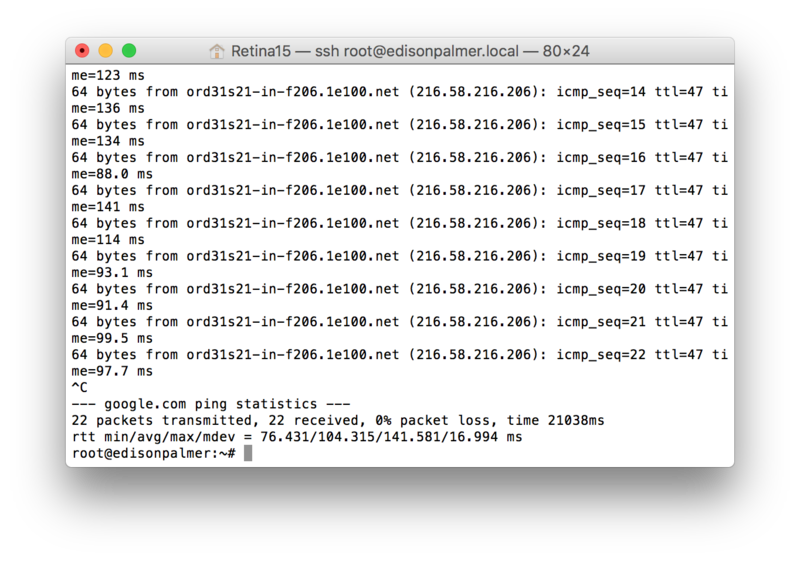 Run ping google.com to make sure your rig is online. If your rig shows up as online successfully, you can enter control-c to exit the ping. A successful ping should look like the screen below. 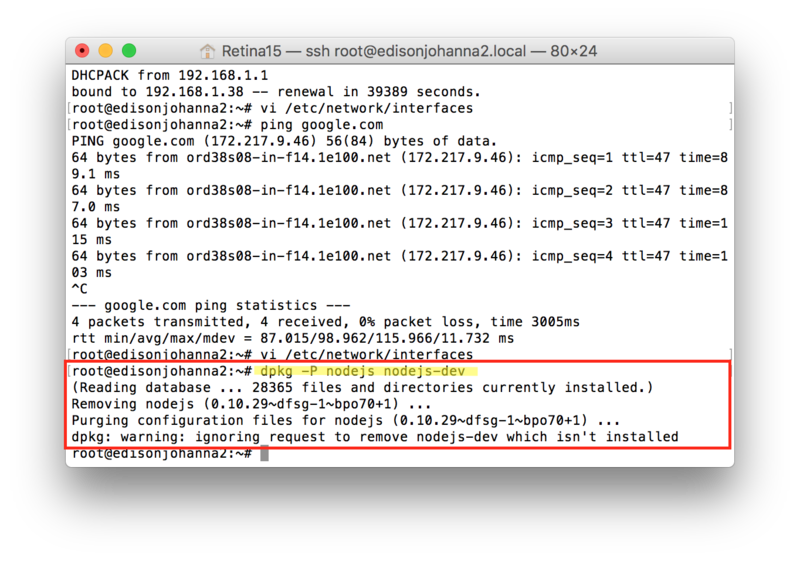 If you are reflashing an Edison, you might get a scary looking error about “WARNING: POSSIBLE DNS SPOOFING DECTECTED WARNING: REMOTE HOST IDENTIFICATION HAS CHANGED!” that is likely because you are attempting to login to a rig that has the same hostname as a previous rig that has been logged into on the computer. You can delete the history of known hosts for the rig by entering the commands cd .ssh and then rm known_hosts. This will delete the log of known hosts on your computer. There’s no significant downside to removing the known_host log, except that you will need to answer yes to the key fingerprint additions again for the first time you login to old rigs again. 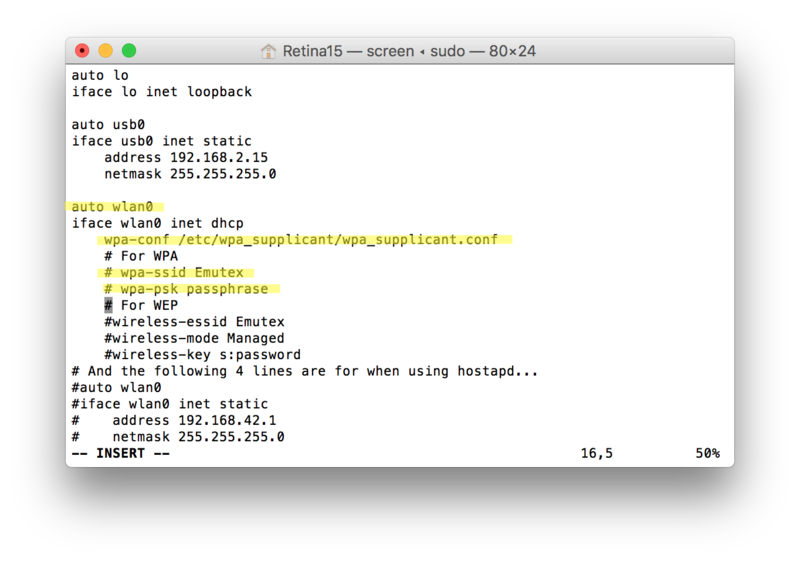 If the rig isn’t online, go back and check your /etc/network/interfaces and /etc/wpa_supplicant/wpa_supplicant.conf files above: you probably either missed a step or made a typo. Usually you will see ping: unknown host google.com if you are not connected to the internet, as shown below. You’ll now want to move on to the rest of the install instuctions. Remember to personalize your settings after you finish installing OpenAPS!